Dedicated volunteers have been tracking the phenology of cloned and common lilacs for decades, and these observations have been invaluable in documenting plant responses to changing spring conditions. In 2012, we launched a campaign to garner more commitment among Nature's Notebook participants to tracking lilacs. Our findings were that lilacs clearly responded to the early warm temperatures of spring 2012. 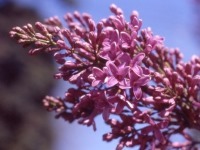 Cloned lilacs (Syringa chinensis), in particular, demonstrated how important warm temperatures are to their life cycle events. 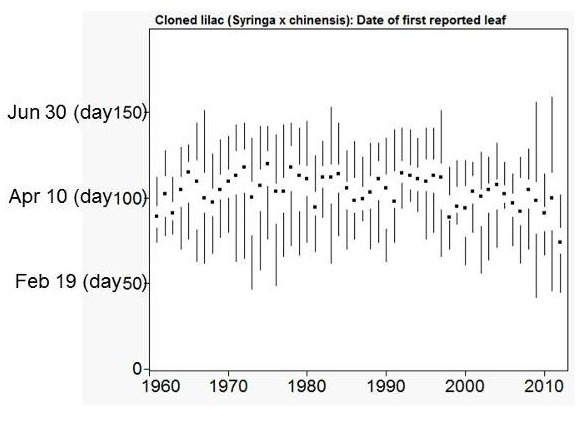 On average, observers first reported "breaking leaf buds" for cloned lilac plants on March 19, which was the earliest average leaf-out date for the entire record of cloned lilacs dating back to 1961. Likewise, the average date observers reported "open flowers" in 2012 was April 20, also the earliest flowering onset date for the entire record. Common lilacs (Syringa vulgaris) exhibited similar patterns in early activity, though not to the same degree. The average date observers reported "breaking leaf buds" for this species in 2012 was March 28; this is the fifth earliest date in the record of leaf onset stretching back to 1967. Similarly, the average date reported for "open flowers" in 2012 was April 22, the third earliest flowering onset date in the flowering record dating back to 1957. What are some implications of such an early spring? What could have influenced the results? These values may be influenced by whether all observers reported their observations. If there were more observers who documented remarkably early activity and submitted their observations than those who recorded later activity, this year's values will show a bias toward earlier activity. Thank you for all the lilac records you gathered. We're looking forward to collecting more lilac data together again next spring and sharing what they suggest!